The Bayesian optimization algorithm (BOA) uses Bayesian networks to learn linkages between the decision variables of an optimization problem. 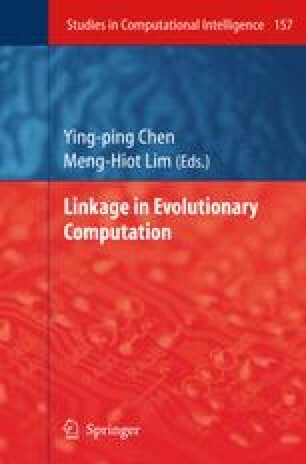 This chapter studies the influence of different selection and replacement methods on the accuracy of linkage learning in BOA. Results on concatenated m-k deceptive trap functions show that the model accuracy depends on a large extent on the choice of selection method and to a lesser extent on the replacement strategy used. Specifically, it is shown that linkage learning in BOA is more accurate with truncation selection than with tournament selection. The choice of replacement strategy is important when tournament selection is used, but it is not relevant when using truncation selection. On the other hand, if performance is our main concern, tournament selection and restricted tournament replacement should be preferred. Additionally, the learning procedure of Bayesian networks in BOA is investigated to clarify the difference observed between tournament and truncation selection in terms of model quality. It is shown that if the metric that scores candidate networks is changed to take into account the nature of tournament selection, the linkage learning accuracy with tournament selection improves dramatically.